Move over Kindle—well, at least until you're in stock again. Ectaco has previously announced the JetBook, which they say is a revolutionary e-book reader. Well, let's just leave that to the readers. 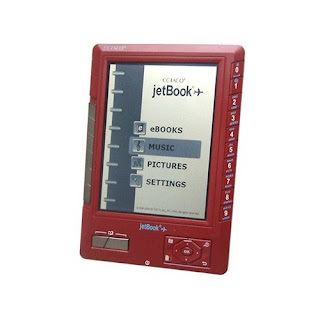 Features of the JetBook Reader include a 5 inch display, built in MP3 player, photo viewer, plus a built-in dictionary and translator. Well, what can you expect? This device is from a company who has made a living selling dictionary and translator software so naturally, they have to include this. The JetBook reader weighs only 7 ounces and very slim. So if you're still waiting for your kindle, you might want to take a loot at this baby.